1:00 I'm going to cover on the stall for +9.5 . I need to leave. May be more. Thanks for coming. Have a great weekend. 12:56 encountering mid day doldrums; holiday may dampen the rest of the day. Overnight swing traders will be covering. The next Essentials of Personal and Market Astrophysics will be taught March 23-25. If you want to come, send Al An Email. 12:09 looking good - just need to be patient. 11:28 letting profits run-this move could have a lot of energy; Tested low of year yesterday, got big buying. but once I'm in a trade I refer to them to see what is going on in the energy fields. They say to hold. 10:35 I also use a 72 hour chart that I cant' show you. On it I have a favorable Face of God pattern. 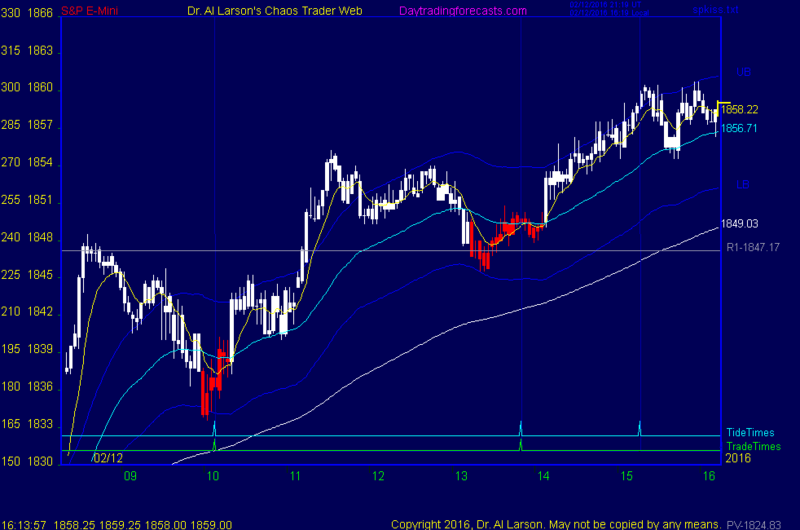 9:21 the high is 1848.5 , buying came in at 1840.5, R1 is 1847.17, so right now, in a trading range. 8:53 Yesterday we had a good example of the true nature of chaos. The market was heading lower in the afternoon. not a PREDICTION. Then out of the blue the market shot up. Someone had a big buy order parked at S2/S3 pivot price. Timewise it was where the rotating exchange passed the Moon. So the order had additional Moon juice. As traders we trade probabilities, but we can never believe that we know exactly what will happen. on different time frames. Me saying I thought we were going lower was not a prediction of a bear market. 2/12/2016 12:10:28 PM MT TG****:: Beautiful CTME setup / paired up with the moon tide timing and the 2-moon day. 2/12/2016 10:48:45 AM MT DPP****:: Al - I don't see the fractal chart in CCT room; the chart there ends near mid Jan.
2/12/2016 10:19:38 AM MT ctr:: Do you know we are near a red swan ? 2/12/2016 7:59:30 AM MT DPP****:: Thank you Al; Also, thank you for your comments on the Chaos Clinic chart page; always good to read these before every trade day; timeframe is one of the winning keys - It took me long time to internalize this when looking at market movements and predictions. Cheers! 2/12/2016 7:42:07 AM MT TG****:: GM everyone. 2/12/2016 7:32:54 AM MT Al****:: DPP: I use Paragon software for backups. They are excellent. I use WinBatch for all sorts of things, including positioning and sizing windows. 2/12/2016 7:26:31 AM MT DPP****:: GM All; Good luck today; Al, at one point you had a list of software you used; disk backup; macro for opening and sizing windows; Do you still have that list somewhere? Thanks. 2/12/2016 6:46:48 AM MT ctr:: Which one do you prefer Al ? And which one has been more effective ? 2/12/2016 6:32:07 AM MT ctr:: Good morning, I am pretty new to the site and I was wondering what is the difference between the +/- tides green/red lines of the chaos clinic and +/- Xtide2Plus green/red lines of the XTide2 chart.